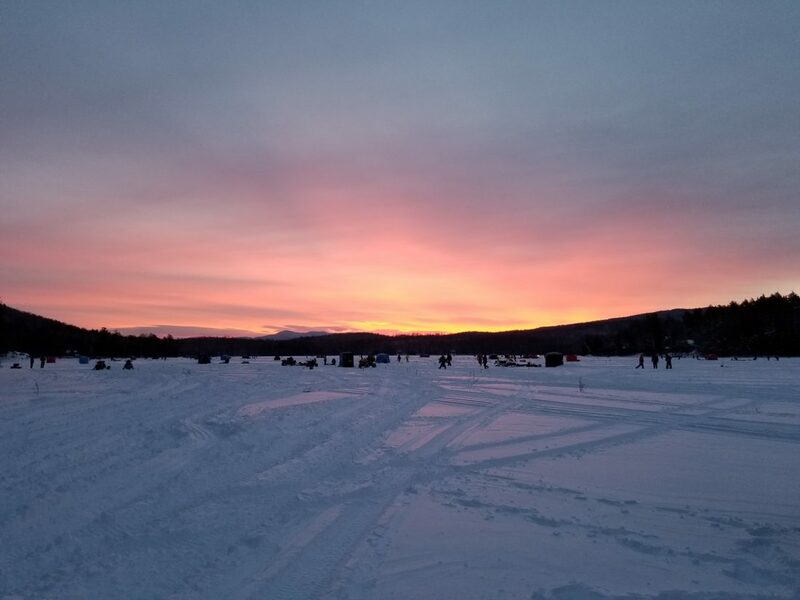 TUPPER LAKE — With 1,200 people out on the ice of Simond Pond for the Northern Challenge Saturday, the usually-empty frozen pond was covered from shore to shore with tents, fires and tip-ups with people from 16 states catching around 190 fish throughout the day. Other ice fishing derbies in the area, including one in Cranberry Lake were canceled this year due to inadequate ice. 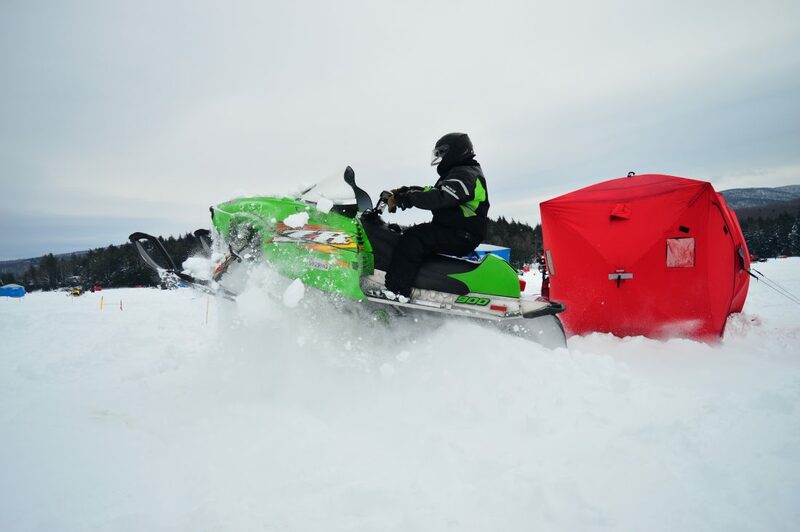 Dave McMahon from the Tupper Lake Rod and Gun Club, which runs the annual event, said that since Simond Pond is a smaller body of water, it accumulates more ice and can support more people. McMahon said the Northern Challenge is the second largest ice fishing derby in the state, behind Sacandaga Lake. Simond Pond is a much smaller area to hold the event than Sacandaga, so the camp sites are clustered into tight, friendly areas. Connecting all these fishing sites is a network of tracks left by snowmobiles, feet and sleds. Anglers drove their catches to the weigh-in station in 5-gallon buckets, lined up at a trailer on the shore to hear their raffle numbers called and transported beer to sites that were running out. When someone brings a pike in to be scored it has to be alive. Sherm LaLonde, who is in charge of keeping the fish alive after they are brought in, said that in the past years competitors have gotten much better at bringing live fish. LaLonde takes the fish to a large, square hole in the ice where he revives them by moving them back and forth to clear their gills, allowing them to breath. LaLonde said in the past, the weigh-in station would have a pile out back of 30 or so dead pike, before he started volunteering his time to keep the catches alive. He still loses three or four each year, but he is able to save many of them. 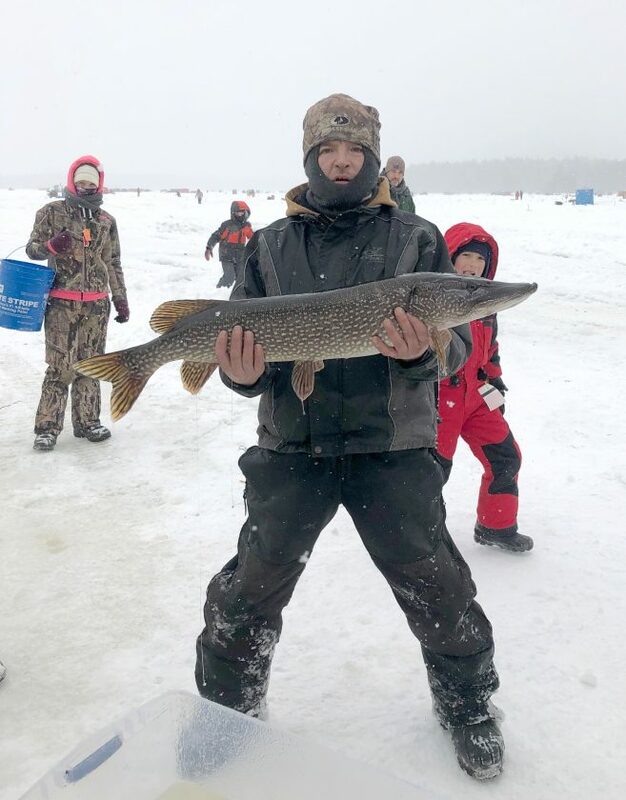 According to a Facebook post by McMahon, the largest fish caught was a 13.59-pound pike, which earned Timothy Herne from Hogansburg a $3,590 payout.